Kitchens are used to be the places for cooking, but now modern kitchens role is expanded dramatically. In addition to preparing food, people eat, entertain, do homework, read, pay bills and watch TV there. 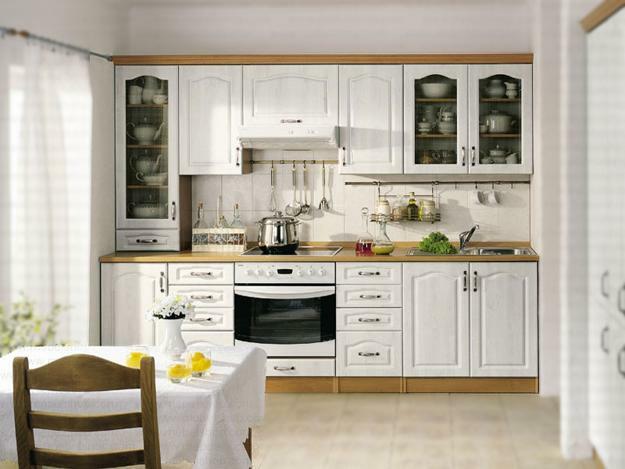 Spacious and bright, multifunctional and comfortable modern kitchen design is very popular. If you want to create functional, interesting and attractive kitchen decor and wisely spend your time and money on remodeling your old kitchen or designing a new kitchen in style, the top 10 modern kitchen design trends will help you make smarter decisions. Today contemporary furniture for kitchen nooks looks more like dining room and living room furniture pieces, and it is easy to find stylish items in matching colors for your existing kitchen decor. In one open space modern dining furniture should match kitchen cabinets for creating attractive and harmonious interior design. Contemporary kitchen design with a small sofa in the kitchen nook is a comfortable option for watching TV, studies or playing games and paying bills. Contemporary kitchens become multifunctional with a space saving sofa that can be transformed into a guest bed or used as a comfortable seating. Modern kitchen cabinets and storage shelves with frosted or stained glass doors are still very popular design options. Glass doors, shelves and shiny home appliances make kitchen interiors look more spacious, interesting and modern. Contemporary design ideas for decorating kitchen appliances, cabinets and walls (stainless steel or mirrored fridge housing, artistic painting designs, interesting fridge door decorating, glass crystals, unique kitchen lighting, stylish bright colors, glass tiles, decorative wall panels made of glass and modern wall stickers create impressive and cheerful kitchen decor. Contemporary kitchen furniture become more versatile, functional and comfortable, bringing flexibility into modern interior design. Modular furniture design is convenient, – a few modular units can create various kitchen designs in accordance with different needs and lifestyles. 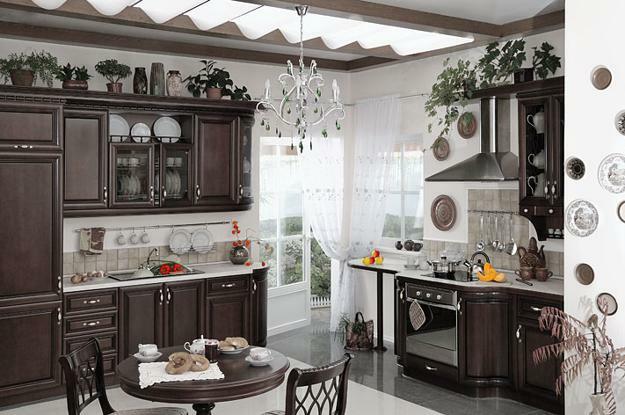 Modular kitchen designs allow to get rid of bulky traditional furniture and effectively utilize valuable small spaces. Sectionals and modular furniture elements look compact and visually increase small kitchens, making modern interiors fell larger and lighter. Old kitchen remodeling or home staging use a similar approach. Getting rid of bulky furniture pieces and utilizing available spaces create light, functional kitchen interiors for stress-free, comfortable and enjoyable lifestyle or prepare a house for quick sale. Airy and inviting modern kitchen designs sell houses fast for a top dollar. Modern kitchen designers offer ergonomic interiors with space saving furniture, water and energy efficient faucets and kitchen appliances. Energy saving freezer-bottom refrigerator, water saving faucets and eco-friendly dishwasher are modern kitchen design trends. 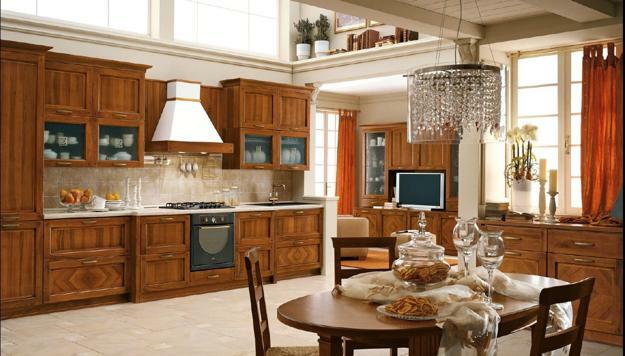 Modern kitchen cabinets design is people-friendly, practical and stylish. Hidden cabinets handles, doors that work on press-to-open principle, rotating or sliding cabinets doors and storage shelves with contemporary kitchen organizers make kitchen cabinets design safer, convenient and more elegant. 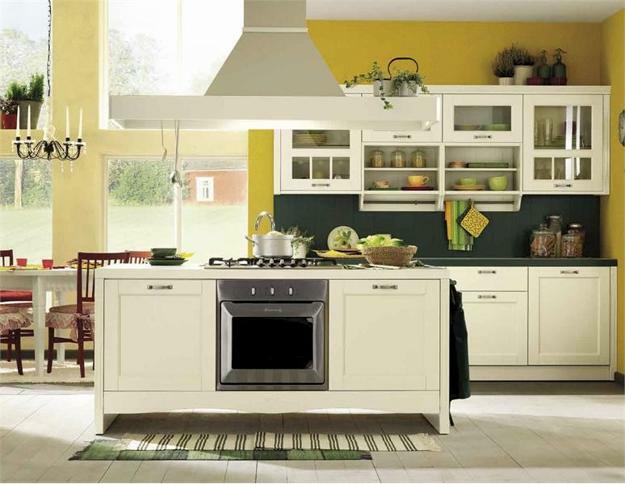 Bright kitchen colors and color combinations are modern kitchen design trends. Vivid and cheerful kitchen colors balance traditional kitchens designs and add interest to straight lines and elegant simplicity of contemporary kitchen cabinets, beautifying interior design with colorful accents. The color palette includes all bright color shades and neutral colors. Stylish interior decorating with sky blue, turquoise, white and green color tones, red colors, rich blue, light and deep purple colors are modern kitchen trends in colors. Extreme simplicity and functionality or bright prints and unusual backspash ideas are two main kitchen design trends. 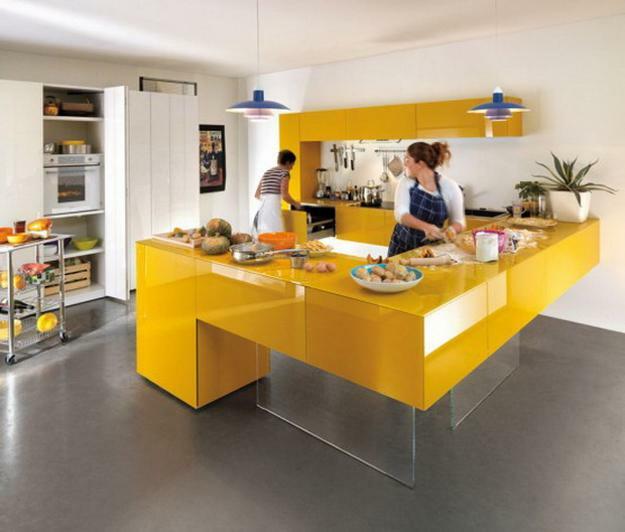 Energetic kitchen colors and sleek forms create beautifully balanced combinations for contemporary interior design. Vivid wall paint, bright kitchen cabinets design colors, stylish stripes, contemporary metal tiles, modern wallpaper patterns, creative backsplash ideas and spectacular wall stickers are great options for creating impressive and unique contemporary kitchen decor. 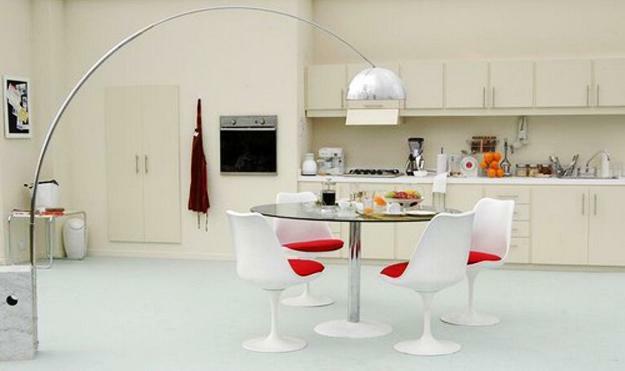 Contemporary kitchen cabinets design and decorating with stickers or beautiful wallpapers look interesting and festive. 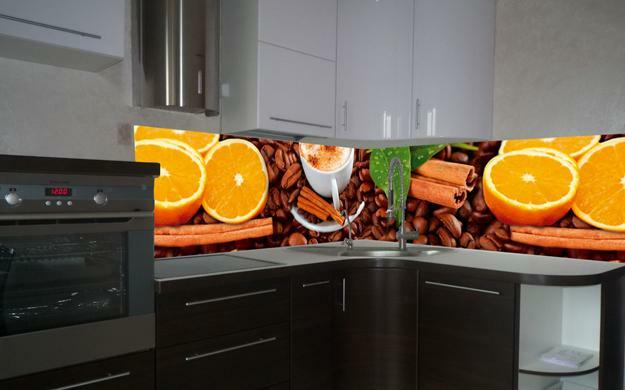 Walls and kitchen appliances decorated with vinyl stickers, colorful decorative wall panels, wallpaper and bright backspash ideas become very popular, offering effective and stylish ways to create fresh kitchen decor that reflects modern kitchen design trends. Kitchen wallpaper is back, and there is a chance to add gorgeous and bold patterns to interior design. 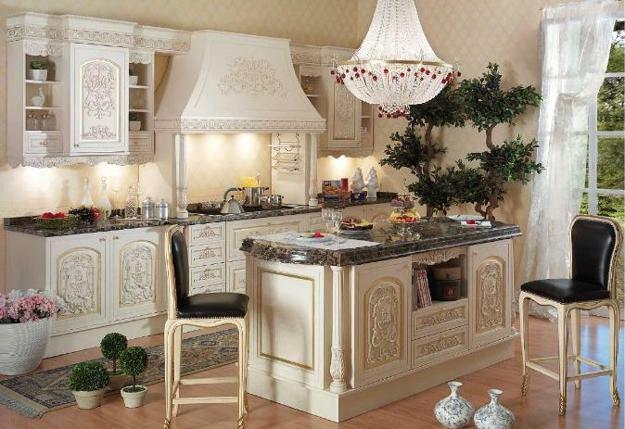 Wrought iron furniture and lighting fixtures, elegant patina, antique metal finishes and aged golden, silver or bronze details create soft, cozy and charming kitchen decor. Wood kitchen cabinets are still more popular then contemporary glossy surfaces. 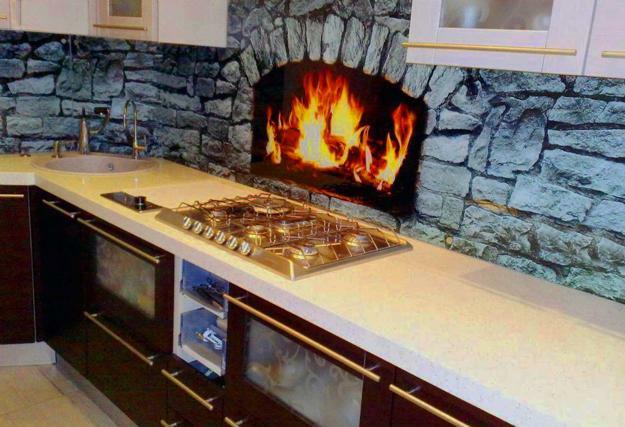 People prefer modern kitchen design created with natural materials, green technology and eco friendly products. 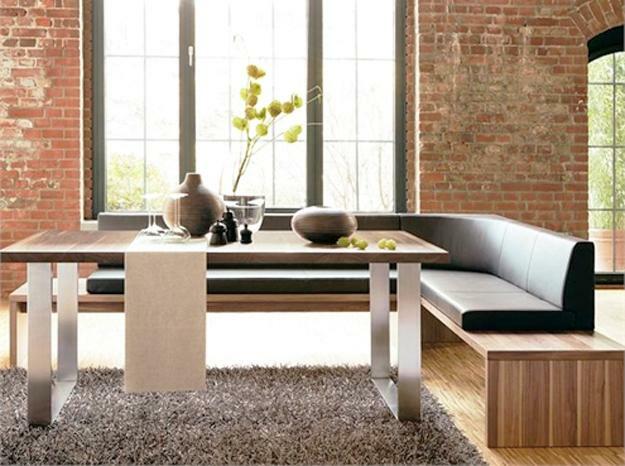 Solid wood furniture design is warm and classy, adding the natural feel to modern interiors. Modern technology allows to produce attractive wood texture with unique effects for various kitchen designs in different colors and styles. The beauty of wood texture is very appreciated, so wooden kitchen decor items, wood furniture and kitchen cabinets are very attractive options for dream kitchen design. Green living ideas and eco friendly interior design trends continue to gain popularity. The demand for eco friendly furniture and modern kitchen decor items, recycled and eco friendly products made of natural materials, only grows. Choosing solid wood kitchen cabinets or high-quality plastic finishes that look and feel like natural wood or stones are modern kitchen design trends. Hi-tech home appliances are a part of everyday life, and modern interior design feature a lot of technical items incorporated into cabinets and shelves. Functional and stylish hi-tech appliances became necessities and unique home decorations. Modern kitchen design elements, like flat screen TVs and computers add comfort and and create multifunctional stylish spaces for contemporary lifestyle. People want to live in harmony with the nature and enjoy modern level of comfort. They prefer green interior design ideas and eco friendly products. Water and energy saving appliances and natural materials transform modern kitchens creating pleasant and beautiful multifunctional spaces. If you think about your home staging or kitchen remodeling project to create a new, attractive, functional and modern space, these top 10 latest trends in modern kitchens will guide you and help spend your money, time and effort on the most important home improvements and enhance your home with modern ideas.